Ripu Bhatia’s time as a journalism student in Sydney was cut short in July 2015, when the Auckland native was diagnosed with meningococcal septicaemia. The now 22-year-old weighed only 30 kilograms after losing his arms and legs to the disease, but that hasn’t stopped him from doing what he loves — playing music. In an exclusive interview with Music Feeds almost a year since his diagnosis, Mr Bhatia reveals how music (and, most notably the guitar) has helped him through one of the most difficult periods of his life. He has also shared some new footage of himself rocking out — catch that alongside his full interview, below. Music Feeds: How has music helped you over the last 12 months? Ripu Bhatia: The last 12 months presented a challenge to me like none I had faced before. I had initially resigned to the fact that I wouldn’t be able to play guitar again, and it wasn’t my greatest concern at the time. My inability to walk and the significant changes to my face took priority, and music was sidelined. What I found particularly frustrating was the fact that I had never achieved anything of significance with music, and that I was never able to show people how far I had come. As the months passed and I returned home to New Zealand, I was faced with the reality of going back to everyday life. It was difficult to say the least, as I was unsure what I wanted or more specifically what I was able to do with myself. It was like I was 13 again, where I spent more time dreaming of playing the guitar than I actually spent doing it. I had speculated ways by which I could play guitar again but none had been successful. When I initially developed a technique which would allow me to play guitar again, it was more about simply proving to myself that I could do it rather impressing anyone or playing well. I strung together a few notes to the tune of [Deep Purple’s] Smoke On The Water, and then attached a slide to my prosthetic which would allow me to play the blues. The satisfaction was instant, and I was really comforted by the fact that despite my situation I was still able to do many things no matter how impossible they initially might have seemed. MF: So the prosthetics seen in your videos are specially made for playing guitar? RB: The prosthetics were initially created as a device to allow me to use my phone. One was designed to hold the phone while the other was to access the touch screen. I modified it by taking the phone holder prosthetic in my right hand and flipping it over so I could pluck strings with it. I then taped a slide to the prosthetic on my left hand and used it to play notes and chords. The original prosthetic was created by an occupational therapist at Concord Hospital in Sydney, where I was a patient for many months. MF: When did you first start playing music? RB: I first picked up a guitar when I was 13 years old and just starting high school. I was really into the ’90s alternative music scene at the time, and was listening to bands like Nirvana, Pearl Jam and The Smashing Pumpkins. Guitar wasn’t something that came naturally to me at all. I took music as a subject at school and it didn’t take me long to realise that there wasn’t really anything special about me. I failed practically every assignment and my lack of confidence meant I struggled with performing. I became a reclusive musician who would spend hours in the quiet comfort of his room repeating the same patterns over and over again until perfection. I gravitated towards blues music, which helped me develop my own style of playing. Over the last few years I grew more confident in my ability and would perform more regularly. I enjoyed creating unique arrangement to songs as well as composing music. Switching between acoustic and electric, I had gradually gained a name for myself amongst various social circles on campus as a good musician. Read more of the interview, and see more music videos, by clicking here! Williams, Tom. 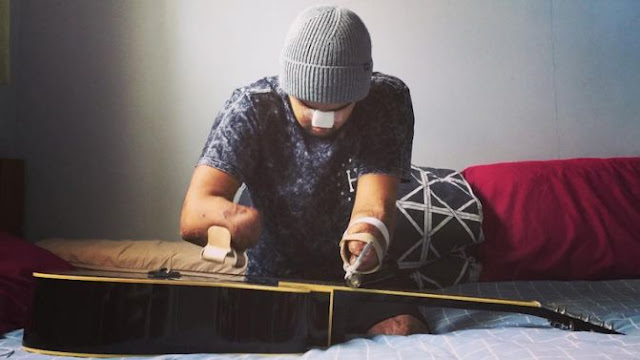 "Meet The Inspiring Young Man Who Still Plays Guitar After Losing His Limbs." Music Feeds. June 26, 2016. Accessed June 27, 2016. http://musicfeeds.com.au/features/meet-inspiring-young-man-who-still-plays-guitar-after-losing-his-limbs/.